For a while now I've been wanting to get family photos up on the walls. It also gives me an opportunity to create a picture gallery which I've been craving for as well. I've chosen the family room for my picture gallery since it gets daily use and the kids may appreciate seeing their pictures up, as would the rest of us! I wanted the picture gallery to balance with existing artwork I have in the room - see below - so I traced the entire frame onto plain paper to use as my guideline. Here are three layout options I'm considering. I would like the frames to be both horizontal and vertical to allow for versatility in the photos. Which layout do you like best? 1) ikea @ 129.99 2) west elm @ $199. 3) pottery barn @ $499. 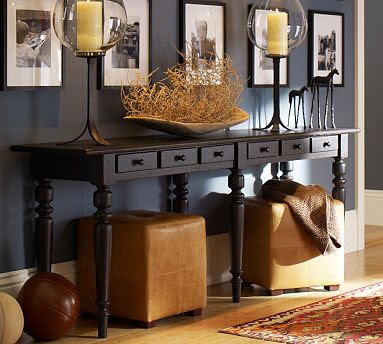 4) potterybarn $299. I love the layout and mix match frames in the picture above but the picture below is more me. Perhaps I'll venture outside the box and give something like the above a try one day! Oh, I also love the deep blue with tan combination in these photo... would be perfect for a den or boys room. Which layout do you favour? Let me know, I'm interseted in hearing from you! I really like option 2 and 3 with the big H on either side. I would put another frame or letter in the empty space on the bottom though. Art walls are so striking if done right. I just discovered your great blog on the Style at Home fb page. I like to find deals also and re create a look for alot less. 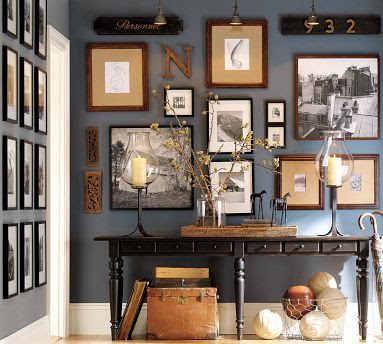 I also love those layouts that you pointed out with the messy/yet organized arrangement of photos and wall art. I can understand why you feel kind of overwhelmed, because I feel the same way, but view it as a collage ;) now that's fun. About your layout options, really like the 2nd one, and on the empty lower right hand corner you can possibly add a wooden accessory....this is what the designers have done in your layout examples! Thanks for sharing, and good luck. Share your pics once you are done! Love your layouts, Wend... I think #3 works best as your storage bins add height to the left side of your wall, so the empty spot would look better above those bins. Although I do agree with both messages above, about adding something a little different in the empty patch you'll have - hanging an accessory piece would work perfectly. Hmmm... now thinking about that, option #2 would also work if you add perhaps a tall statue/figure on the floor beside your fireplace... then the height would help cover the empty spot on the right if you used that layout. Can't wait to see the final picture! The third layout is my favourite. I think it'll sort of carry the eye across the pictures and then to the fireplace. The gallery wall in the PB pictures is fantastic. The wall colour and variety of frames and the layout all work so well together. The black lamp is pretty great too!